I've done my fair share of reading Stephen King, but most of his longform work can be just that....work. I've mainly enjoyed his short stories in "Night Shift" and "Skeleton Crew," but that's mainly because I have a short attention span when it comes to reading. 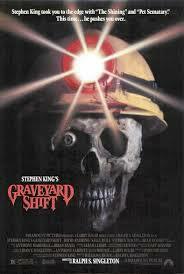 This brings me to a film that while it isn't very good, it's very memorable; "Stephen King's Graveyard Shift." "Shift" is the tale about a backwoods town where the economy is based around a mill that is infested with rats, and other murdery type creatures. A group of men, and a woman, are tasked with cleaning up the mill and getting it up to code by clearing out out the rat problem. However, there is bigger, deadlier, problem around the mill and people start turning up dead. The film runs a tidy 88 minutes, which is just the right amount of time to tell the tale of a mill with rat problems, but there are plenty of fun takeaways from this film. One, Brad Dourif, who you might knows as the voice of Chucky, or if you're not a horror fan, as Grima Wormtounge in the "Lord of the Rings" trilogy, plays the creepy exterminator who hates rats and makes an instant impression. He reminds me of the foul-mouthed cousin of John Goodman's exterminator in "Arachnophobia." Two, there are some very odd accents in this film, namely Stephen Macht, who's accent is a place between a southern plantation owner and a British parliament leader, it's just odd, and somewhat oft-putting. Three, and this is only if you stick around for the whole film, the credit song. A combination of lines from the film and jazz beat, this might be the most memorable part of the film. Overall, this isn't a bad film, it's just a Stephen King short that ended up being a film like so many films before and after. "Gravetard Shift" just happens to have enough quirks to make it enjoyable and memorable. Oct 21, 2015: A Sneak Peek into our Future!